WWE Milwaukee tickets are on sale now. You'll discover a great WWE ticket selection here. When the WWE comes to Milwaukee, WI, you can expect to see some of the best professional wrestlers in the world so book your tickets now. Our ticket prices for any of the WWE's tour dates are excellent and we're committed to getting you into the best seats to enjoy the live wrestling event. Search through our large selection of tickets and locate and purchase your seats for the Milwaukee, Wisconsin WWE tour stop here. The types of WWE Fiserv Forum seating that is usually available here include: ringside seats, club seats, VIP seating, upper and lower concourse tickets, grandstand, luxury suites, e-tickets, and cheap WWE Fiserv Forum tickets. 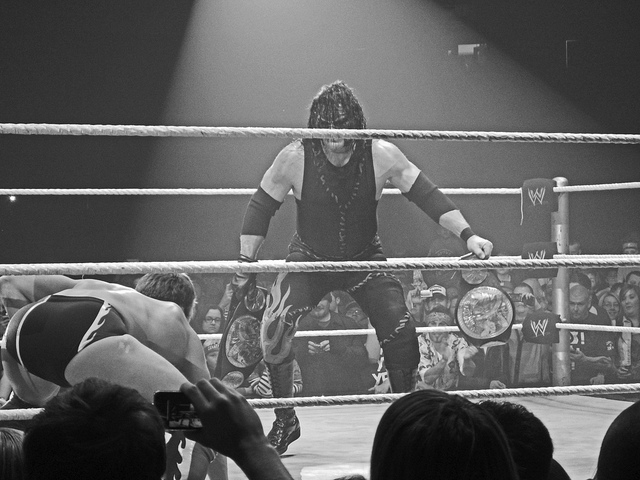 And next time you want to go to any live WWE event in Milwaukee, shop here at ClickitTicket. World Wrestling Entertainment ticket prices may be above or below face value and can fluctuate but we try to keep our prices as cheap as possible. To find the current Milwaukee WWE ticket pricing, click the red 'Tickets' button above. All ticket sales are final. Our WWE pro wrestling tickets are unique and can't be replaced, therefore there are no exchanges or refunds. If an event is rescheduled or postponed, your tickets will be honored for the new date. Learn more. You can choose either standard or express delivery and you can specify special delivery instructions if necessary. Your WWE Milwaukee, Wisconsin tickets will be shipped to you using Federal Express. Also, some WWE tickets may be available for immediate download as e-tickets, or electronic tickets. World Wrestling Entertainment, Inc. (WWE) has built an empire within the world of professional wrestling. Boasting top numbers of 14.4 million viewers in the U.S. and broadcasting shows in 30 languages to more than 145 countries, the WWE enjoys two major brands: Raw and Smackdown. The McMahon family – headed by Vince – are the principal stakeholders in the company with a 70% financial stake and a 96% voting share. In what has long been the family business, Vince McMahon serves as chairman and CEO of WWE. The origins of the company date back to 1952 and the Capitol Wrestling Corporation Ltd moniker which promoted shows via the World Wide Wrestling Federation (WWWF), later becoming the World Wrestling Federation (WWF). McMahon&apos;s Titan Sports bought the company out in 1982. A 2000 dispute with the World Wildlife Fund led to the eventual WWE tag. Among the early stars of McMahon&apos;s WWF were Hulk Hogan, Roddy Piper, Andre the Giant, and Jesse Ventura. Hogan&apos;s role in Rocky III catapulted him and the Federation into the national spotlight.